A Filipino American triathlete who ruled the previous Timex triathlon here is among the big names the country is looking at, as the Gran Fondo New York (GFNY) opens its inaugural Philippine qualifiers to the New York Cycling Marathon in Bohol January 27. ArlandMacasieb, elite triathlete based in New Jersey along with a good number of promising Filipino speedsters on pedals and Lycra, would be bringing the name of the Philippines as the locals crank it out against 400 other cyclists from 14 countries joining the inaugural mass start GFNY race from the Pavillion of the Bellevue Hotel in Panglao and off to mainland Bohol. Already rated as among the region’s international greats, Macasieb and a horde of local cyclists can only use the familiarity of the course as their ace on the sleeves, as the best of the best GFNY races in the region have descended here to take a spin at that prestigious front corral in the GFNY world event in May. Macasieb who has been competing internationally, however, is coming to Bohol with a new excitement: to realize the goal of bringing the international GFNY brand to the Philippines. Macasieb said the green and GFNY black jerseys are ubiquitous in the NYC area and I know the GFNY series is global with events in our neighboring countries of Malaysia and Indonesia. Coming to the Philippines was the next logical step. Although admitting that bringing an inaugural event in a place would be tough, Fluhme cited the birth pangs, but nevertheless, they were still able to generate over 400 bikers from 14 countries. Basically a personal endurance challenge where athletes compete against others, the clock and yourself, the GFNY in Bohol also puts the chance for local cyclists to qualify for a front corral start at the GFNY World Championship in NYC this May, 2019. Since 2010 when GFNY envisioned the bike race until May, when it started its races at the iconic George Washington Bridge in New York, the gran fondo has maintained its characteristics as a mass start race with an individual chip timing from start to finish, and since this means racing against the self, the race ensures closed roads or police moderated traffic so cyclists would need not stop during the race. 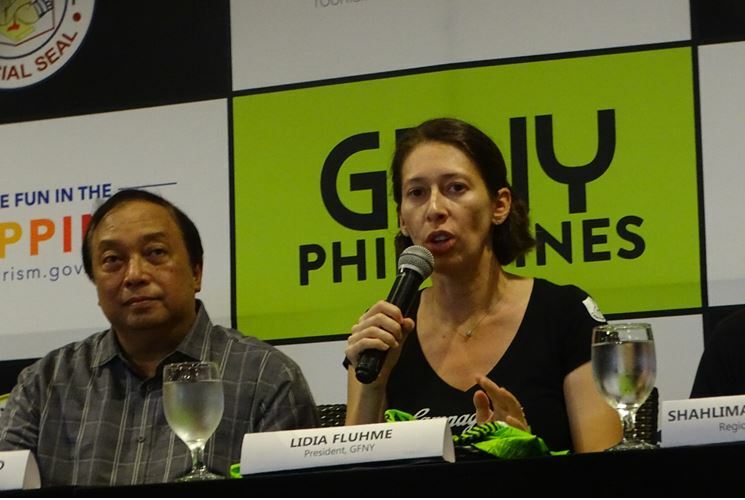 GFNY president Lidia Fluhme said since 2014 when GFNY first held its world event in Italy, the race has transformed into the world’s largest cycling marathon series with 20 events held in Argentina, Brasil, Chile, Colombia, Dominican Republic, Ecuador, Indonesia, Italy, Israel, Mexico, Panama, Portugal Uruguay, the USA and the Philippines. Upon invitation of the Department of Tourism, Tourism Promotions Board and Susan del Mundo, tourism attache in New York, GFNY came to the Philippines and immediately considered Bohol, Fluhme bared. ForMacasieb who came to Bohol for the GFNY route ocular inspection, he said Bohol will always have a special place in his heart. “I won the inaugural Timex 226 Iron distance triathlon there back in 2011. The roads in Bohol are nice with awesome views and low traffic,” he said. “There is light traffic and there is a great scenery, warm people and the community support is always evident,” another GFNY registered racer who had his race course familiarization, said on Friday. Fluhme who finished Hawaii triathlon 7 times and who races with her husband, also explained: GFNY is not just a race. It is families bonding, and the presence of various destinations here, Bohol is an ideal vacation hideaway for the family of the bikers. In Bohol for the first time as it is in the Philippines, GFNY in Bohol features a race for the long route which is 144KM and includes 1611 meters of climbs where only the finishers of are given category rankings and overall as well as podium awards. From these, top ten of the age categories are qualified for the race corral at the GFNY world event. Also open is the medium course of 66 kilometers and 554 meters of climb. Featuring chip timing system, the race put in chips in every competitor, which by radio frequency identification system, can be read as the bikers pass close to a proximity sensor which records their time. As to the Bohol hosting the race, local authorities including the DOT, TPB, Tourism Infrastructure and Enterprise Zones Authority, Bohol Provincial Government and Bellevue Hotels have organized coordination meetings with LGUs especially those within the race course to assure the safety and security of the race. We have seen the LGUs work and we are excited at the way they are helping us, Fluhme told media during a press conference Friday. Bohol Governor Edgar Chatto, who admitted he had no second thoughts about hosting the event. In fact, with the GFNY here, organizers are already planning for another race in September, here in Bohol.